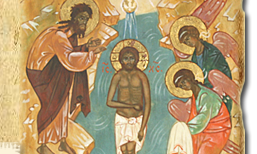 Welcome to St. John the Baptist Orthodox Church's website! Browse the tabs for information about Orthodoxy, weekly bulletins, and events. Lent, meaning "springtime," was originally simply known in the Church as "40" (Gk., tessarakonti; Lat., quadragesima). Originally 40 hours prior to the annual celebration of our Lord's Resurrection - Pascha (lit., "Passover"), the time period from Christ's Crucifixion on Friday morning to His rising from the dead early on the first day of the week (i.e., Sunday), the season of "40" expanded to a conventional unit of 40 days. In the Orthodox Church, Lent is a continuous period of 40 days prior to Holy Week, the week of our Lord's suffering, death, and Resurrection. This year Holy Week is April 20-27; Pascha is April 28. Orthodox Holy Week commences with the Raising of Lazarus (John 11:1-45; Saturday) and the Entrance of Christ into Jerusalem (John 12:1-18; Palm Sunday). Then for three days Christ taught in the Temple and on the Mount of Olives opposite the Temple (Matthew 21-25). On Wednesday the Apostle Judas went to the Jewish chief priests and scribes with plans to betray his Lord for thirty pieces of silver. Thursday was the eve of Passover when Jesus instituted His Lord's Supper with His apostles and washed their feet at the Table; He then led them out of Jerusalem to the Garden of Gethsemane ("olive-press") where He was arrested and delivered to the clandestine Jewish High Council for condemnation. On Friday, Jesus was taken to the procurator Pontius Pilate by whom He was delivered over to be executed by crucifixion on a Cross, the deathpenalty reserved for the lowest of Roman criminals. Finally, after "giving up HIs spirit" on the Cross, Christ's body was taken by Joseph of Arimathea, a member of the Jewish Council, and buried in his tomb hewn out of the rock. On that Saturday, the Sabbath, our Lord "rested from all His work," rising early the first day of the week incorruptible and triumphant over sin, death, and the power of the devil. If you are interested in the Orthodox Faith, we welcome you to come and meet with us and pick up many interesting and informative pamplets that are available for you! If you should have any questions please feel free to call me at the Church at (330) 372-3895. During times of inclement weather, especially snow and ice, we do not cancel services scheduled at St. John's. Use your best judgment as to whether or not you can travel from and to your home to attend. Click Here for the Daily Scripture Readings. Click Here for May 2018 Made With Faith prayers and devotions for the Orthodox home. Here is a link to our Church's You Tube Page! Come and explore our Orthodox Faith and Church!